The Mekong River is one of the world s 10th rivers in its river length and has great influences upon nature and societies of the Indo-china Peninsula. The name "MEKONG" originates in Thai language, Mae Nam Khong. 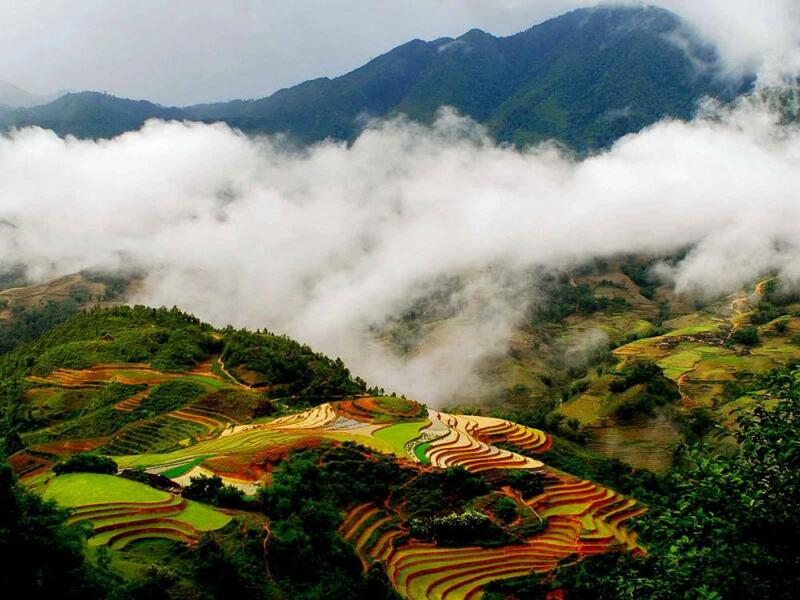 The source of the Mekong River is in Tibet Mountains and is called Dza Chu River (River of Rock). After running through very narrow valley paralleling to Yangz Jiang and Salween River, the Mekong reaches to Yung-Nan Province of China and is called Lancang Jiang (Turbulent River). Via Golden Triangle, the crossing of China, Myanmar and Laos boarder, the Mekong flow into Vientiane Plain. The term, Lower Mekong means downstream segment from the point. 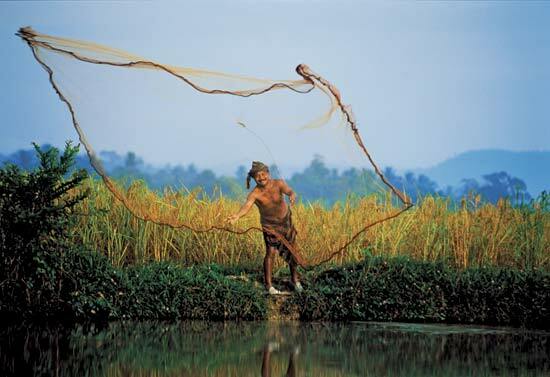 There are some notorious rapids for French navigation plan in colonial period before the Mekong get to Cambodia, and the last segment is the Mekong Delta in Viet Nam, which distributes grate influences to agriculture, especially paddy fields there. From 8h00 morning, pick up at hotel. 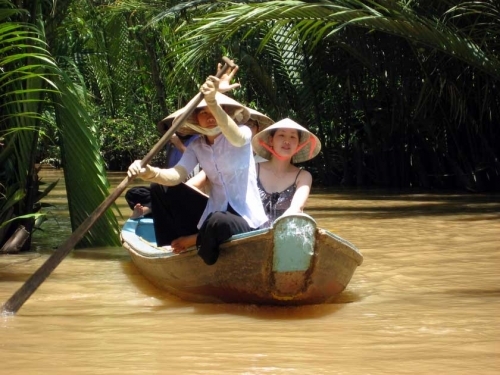 Cross Mekong river by motorized boat.Row- boat ride along small creeks to Mekong River estuary. Motorized boat ride to Con Phung (Phoenix island): have Vietnamese lunch , see the manufacture of handicraft made from coconut trees. 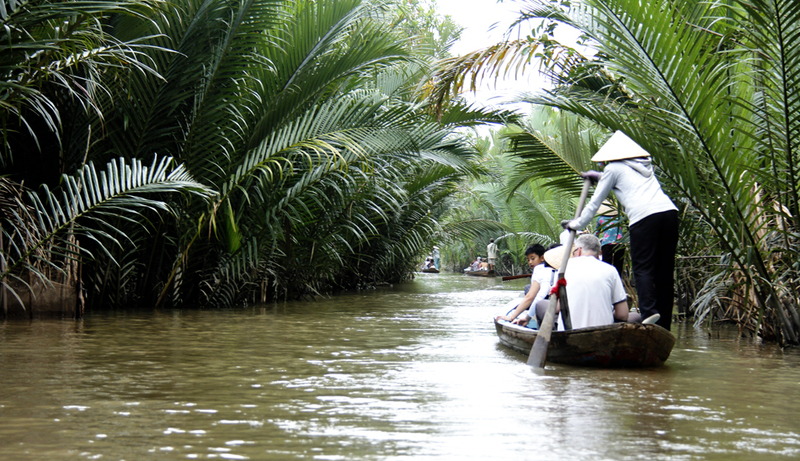 Motorized boat cruises along natural creeks and quiet village in Ben Tre province. Visit orchards,bee - keeping farm,taste natural honey & honey wine, enjoy tropical fruit, traditional music see round a distillery.See Coconut candy production process, taste candy & Coconut pulp. Back Saigon. End tour.